Generally when substituting yarns the recommendation is to look at the gauges of both yarns and compare. We also tend to look at fiber content, the named weight and construction when that information is available. There is another component to comparing that has a big impact on row gauge and I rarely see it covered in discussions of yarn substitution. When you are swatching if you can get the right number of stitches per inch but have too many rows, your yarn is too thin. If you can get the right number of stitches per inch but have too few rows, your yarn is too thick. The question is how to get that information from the ball bands. The way to do it is by comparing yards/ounces to meters/grams. As an example lets say you want a substitution for Nashua Wooly Stripes. If you go to Ravelry and do a search,you can get most of the details about that yarn. Next do an advanced search inputting the info you collected; 1 fiber, 100 % wool, Aran weight - you will get 909 possibilities but lets make it even closer and add the description single in the search box. You will get down to 49 possible matches. Notice also that the gauge info for Wooly stripes says 16 -18 stitches on a 5 - 5.5mm. Take a look at Shakespeare by Artful yarn and notice that it is 123 m/100 grams or 123 divided by 100 which equals 1.23 m/gram. 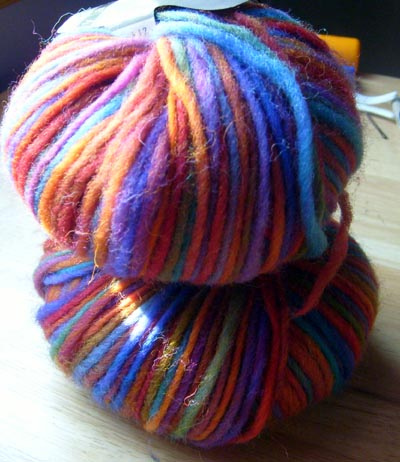 Compare to the Wooly Stripes 80 m/50 grams or 1.6 m/gram. 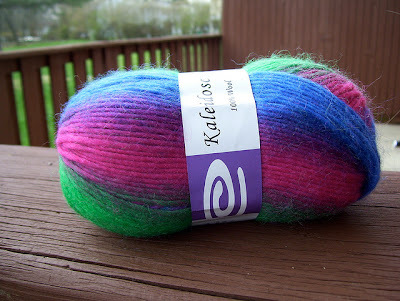 Now take a look at Kaleidoscope by Elegant yarns, the conversion here is 1.59m/gram. I think this one is more clearly a closer match in weight to the original yarn. Also note that the gauge info for this yarn is 18 - 20 stitches on a 4 - 5 mm. The info overlaps but is not exactly the same. Did you notice how very similar the yarns are? I have one more tip here to add here. It is not unusual for yarns to show up that are exactly the same from different companies. Yarn mills sell the same yarns and let the companies label them with different names. Sometimes the put up is different 50 grams vs. 100 grams balls, and often the yarn company gets exclusivity on the colours so that the other company with the same yarn appears to have something different. Watch out for this when you are searching for substitutions. This is so clear and helpful, thanks Robin! What about the length of the color runs? 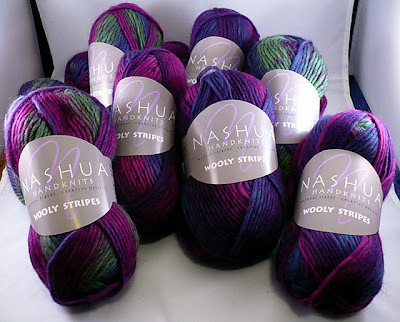 It looks like the Shakespeare yarn doesn't have long color runs (might be wrong, but looks that way), so the effect in the vest pattern would not be at all the same as the Wooly Stripes, would it? Possibly the Kaleidoscope has similar length color runs to the Wooly Stripes in which case it would be a good substitute. Has anyone worked with it? Thank you for the information. It is very helpful and so far is the first I have seen about having the correct stitches per inch but having too many or not enough rows for the swatch.